Dave Johnson, a member of the Sarnia Walking Club for almost thirty years passed away recently at the age of 73 years, leaving wife Tina and 5 children. 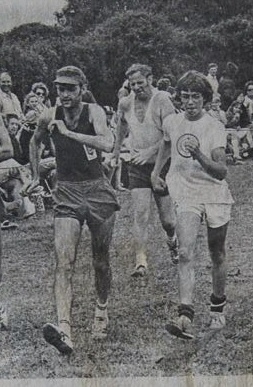 Dave first competed in 1970 in the races organised by the club over short distances to encourage newcomers to the event. He raced in the Inter Firms events for the Co- Op for whom he worked for from the age of 20 until last year, a total of 51 years, as well as the North Regatta walk. He moved on to compete in the traditional Guernsey Church to Church walk over nearly 20 miles, an event he was to start on 25 occassions from 1971 t0 1995 and only failing to finish in his last one. He is fourth in the all time list of finishers for this walk. He represented the Sarnia Walking Club in England and was part of the winning team in the prestigious Chippenham to Calne 6 miles road walk in 1974 finishing in 50.45. The following year he went quicker with 50.12 but the club could not defend their title this time. Team from 1975 pictured here with Dave on the right. He also represented the club over 10 miles in London in the Garnet Trophy and at the York Postal 7 miles road walk and local matches versus Newham AC, Dawlish RWC and RAF. But things were not all going well at the start of his career. As Dave has told me more than once, his style at the beginning was “poor and not very athletic” and club coach Rob Waterman had almost told him to walk properly or “go away”. Dave had joined in with the club training sessions from Salerie Corner for some time and one night, almost overnight his style changed with the help of Waterman and the group much to their astonishment. From then on he made great strides in his performance and within four years had broke the 7 miles in the hour barrier with a 58.55 clocking. That year he recorded his best Church to Church walk performance with a time of 3 hours 02 minutes and 40 seconds for third place, a vast improvement on his first attempt. 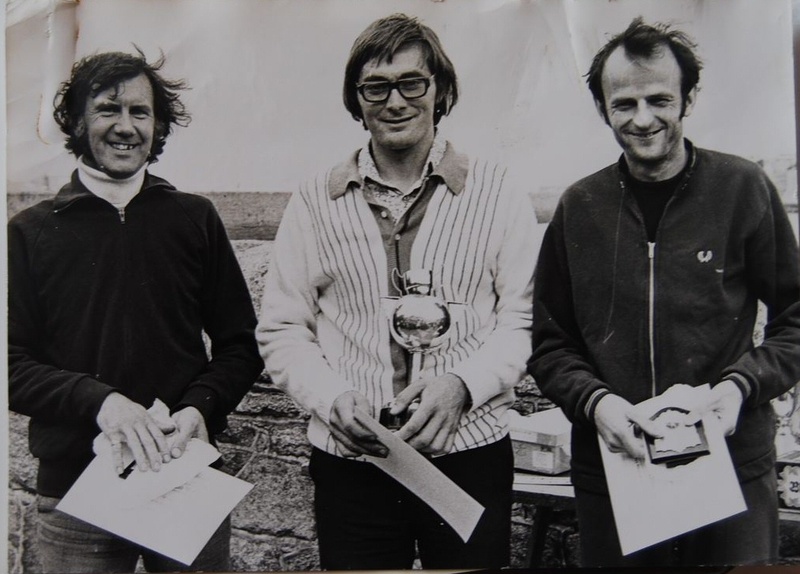 Dave is pictured below with 2nd placed Mick Elliott and winner Dave Dorey in the 1975 Church walk and in the photo on the left in a West Show event. His best years, after starting to race at the age of almost 30 years old were in the mid 1970`s when most of his best times were recorded. 1 mile 7.42 1975, 2 miles 15.41 1972, 6 miles 49.08 1974, 10 kms 52.57 1974, 7 miles 58.55 1975, 10 miles 86.29 1974, 20 kms 1.50.59 1975, 30 kms 2.54.31 1975 and 50 kms 5.33.06 1974. Although slowing down he still enjoyed the racing and always gave it his all, with his style that could be spotted from a distance and the heavy breathing that usually accompanied it! 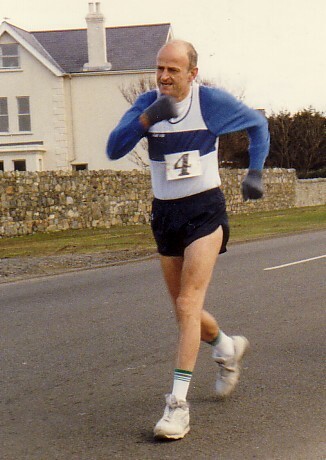 He managed to walk for Guernsey in the 1987 Island Games held in Guernsey over 10 kms. Things were a little slacker in those early days and although not part of the “official team” he walked as a guest walker. 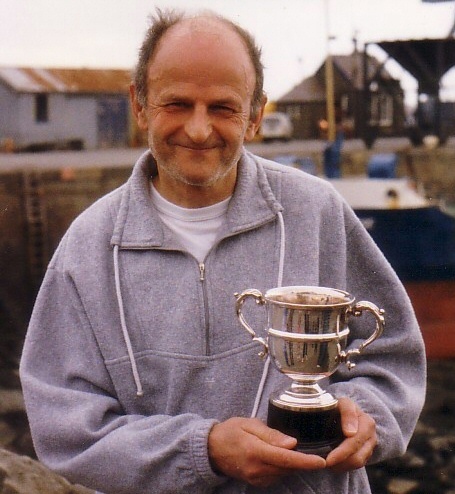 Dave did not win many races but claimed a Chilcott Cup win over 7 miles in 1997 in which he is pictured at the top of the page, with the trophy. I spent a few walking holidays with Dave and others in England, taking in the likes of Chippenham, York and National Junior Champs (in which he supported me), staying with relatives, who Dave stayed in contact with for some time and getting in training with the York INL team. Dave or “Johno” as he was usually referred to as, always got a warm welcome in York. Dave continued racing until the late nineties, when he retired from walking and dedicated himself to his young family. Thoughts at this sad time go out to them. 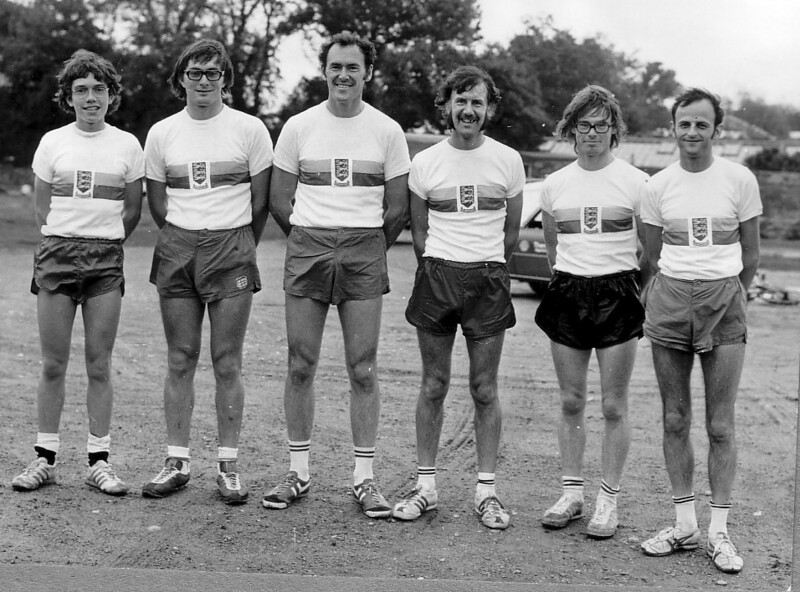 Dave in black shirt, second from left in one of his first races at 1970 North Regatta. Thank you so much for your lovely tribute to my brother David. He thoroughly enjoyed his years with the Sarnia Walking Club and I remember so well the number of times we spent following him around in the car with a bucket and sponge when he competed in the Church to Church walks! David was a very modest man and our family was extremely proud of him. He is sorely missed by us all. Your welcome. Dave was one of lifes “good guys”. Good times over the many years I knew him. Bucket and sponge job……I have done that a few times for my dad Mick Elliott when I was still at school!. Mick and Dave both started walking at the same time.